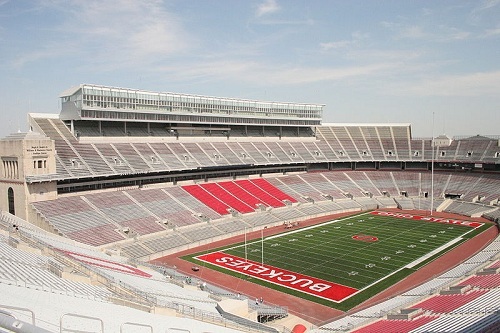 Ohio Stadium is the centre for the Buckeyes football team at The Ohio State University. It is popularly known as The Shoe, The Horseshoe or The House that Harley Built. 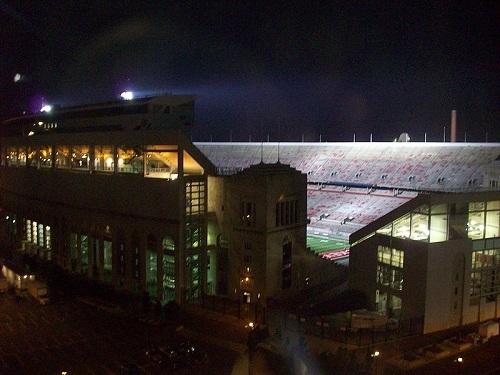 The Ohio stadium is located in Columbus, Ohio, United States. This stadium has gained quite a lot of historical importance. Its name was added to the National Register of Historic Places by the National Park Service on March 22, 1974. It has a capacity of accommodating 102,329, people. It is the third largest stadium in the NCAA and the sixth largest non-racing stadium in the world. 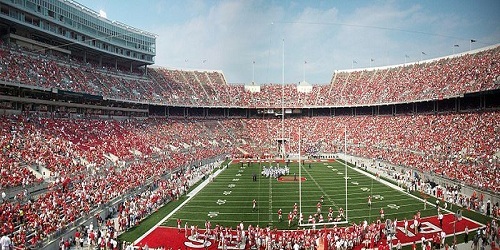 It is also the largest stadium in Ohio, Columbus, United States. Ohio Stadium is also used for organizing concerts. Famous plays that of U2, The Rolling Stones, Pink Floyd & Metallica have also been played at Ohio Stadium. The stadium lacks the provision of field lights which causes quite a lot of inconvenience when night events take place. For lighting purpose, special arrangements are made. This was done for major events in 2005 game against Texas and the 2006 nationally televised game with Michigan. The first game in the stadium was against Ohio Wesleyan University on October 7, 1922, and brought a crowd of around 25,000. More than half the stadium was empty. It got people concerned about the success of the new stadium but the concern was short-lived. In the stadium’s formal dedication against Michigan on October 21, which the Wolverines won, the concern was put to rest. The crowd was announced at the game to be 72,000, but no one is really sure how many people made it into the stadium. This attendance mark was broken in a game against Michigan in 1925 when 90,411 came out to support the Buckeyes; this is also the last time standing-room-only tickets were sold for a game. The initial seating capacity of the stadium was 72,000. With time, minor changes had to be made. The seating capacity of the stadium was raised to 90,000. Heavy renovation was carried out from 1999 to 2000. The stadium was heavily renovated from 1999 to 2000. The press block was replaced and additional seating arrangement was installed above the existing upper deck, and 81 luxury suites and 2,500 club seats were added. The south end zone scoreboard was also replaced by a 90ft. x 30ft. SACO Smartvision video board that is able to show replays, highlights, animations, graphics and statistical information. Additionally, a smaller version of the south end scoreboard was added to the north end and a new LED ribbon board that runs end-zone to end-zone was added to the balcony prior to the 2009 season. A new stadium named Jesse Owens Memorial Stadium specifically for tracks by the university nearby, thus the track at Ohio Stadium was no longer needed. The track was removed and the field of play was lowered by 14.5 feet to add additional seating closer to the field. The temporary bleachers in the south end zone were replaced with permanent seating. However, the south end of the stadium remains partially open, thus allowing the stadium to maintain its notable Horseshoe configuration.